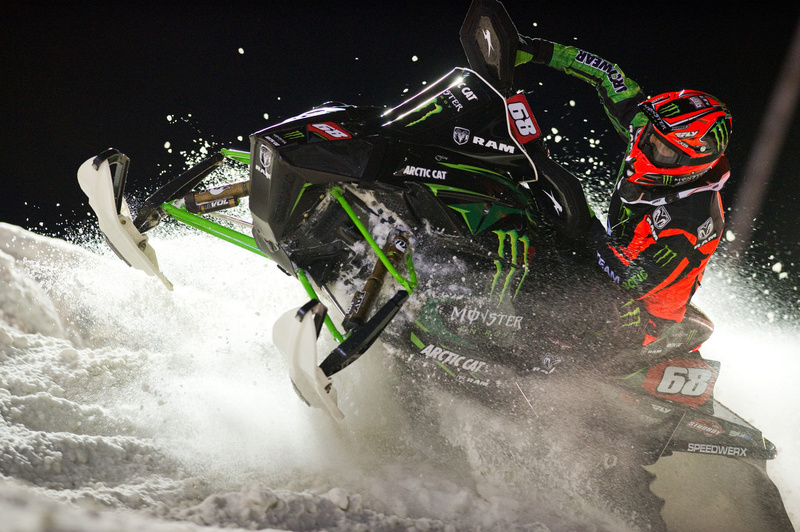 November 2015 - Midwest Sports Publishing Network, Inc.
(November 29, 2015) – Monster Energy / Arctic Cat / Ram Truck’s Tucker Hibbert secured the ISOC National Snocross Pro Open points championship lead with a win at the 2015-2016 season opener in Duluth, Minn. The nine-time champion put his experience to work with a solid win Saturday and heart-pumping race through the pack Sunday. In front of a maximum capacity crowd, Hibbert pulled off a big win Saturday night. A fifth-place start in the Pro Open final forced him to push hard in the opening laps on Spirit Mountain ski hill’s icy, rough track. Nine laps into the 20-lap, 15-rider final, he made the move on leader no. 324 Kyle Palin and pulled away for the win. It marked his fifth consecutive Duluth National Pro Open victory. In Sunday’s final, Hibbert got a mid-pack start and spent the first half of the race searching for lines to make passes on the tight track. By the time he moved into second place, front runner, no. 53 Kody Kamm had already stretched out a near a nine-second gap. Navigating through lapped traffic, he consistently chipped away at Kamm’s lead. The final lap, he latched onto Kamm’s rear bumper and it was a fight to the checkers with Hibbert finishing just 0.477 of a second shy of the win. After a weekend off, the ISOC National Snocross tour returns to action at Buffalo River Race Park in Glyndon, Minnesota December 11-12. For more information on Hibbert and his schedule this winter, visit tucker-hibbert.com. 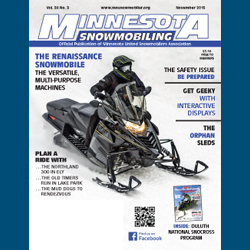 (November 30, 2015) – As snowmobilers eagerly await the first significant snowfall, most of the state’s snowmobile trails are not yet ready for riding, according to the Minnesota Department of Natural Resources. More snow is needed before trails can be ridden. The ground must be frozen to allow for crossing wet areas. Adequate snow cover, about 12 inches, must be on the ground to allow for packing and grooming of the trails. Trails must be cleared of fallen trees, signs put in place and the gates opened. Snowmobile club volunteers and DNR staff are currently working on these tasks. The DNR recommends a minimum of 5 inches of new clear ice for snowmobiles. When the trails open, the DNR urges riders to use caution. Early season trails may have trees or other debris across the trails, unfrozen areas, rocks or ruts, or standing crops and closed gates. Also, road ditches can have obstacles such as culverts, signposts and rocks. While snowmobilers wait for the arrival of more snow, now is a good time to verify their combined registration and trail sticker is current, ensure their snowmobiles are in good operating order, review safety training, and check local trail maps for any route changes or new trails. Registrations and trail stickers for new snowmobiles must be purchased in person at any deputy registrar of motor vehicles or at the DNR License Bureau in St. Paul. Renewals of registrations and trail stickers may be done in person, or online at http://licenses.dnr.state.mn.us/. Minnesota has more than 22,000 miles of groomed snowmobile trails; more than 21,000 miles of them are maintained by local snowmobile club volunteers. Snowmobile trail maintenance costs are partially funded through the combined snowmobile registrations and trail sticker sales, and state gas tax attributed to snowmobile use. Donations and volunteer work by trail clubs make up the remainder of the costs and efforts to operate these trails. Trail users are always encouraged to call in advance or research online to get local conditions for the area they plan to ride. State trail conditions are posted each Thursday on the DNR website at www.dnr.state.mn.us/snow_depth/index.html. Links to snowmobile trail information, state trail maps, regulations, safety training, and more is available on the DNR website at www.mndnr.gov/snowmobiling. Local trail conditions are often posted online by local tourism associations, chambers of commerce and volunteer snowmobile clubs. To find the nearest club, visit the Minnesota United Snowmobiler’s Association website at www.mnsnowmobiler.org. 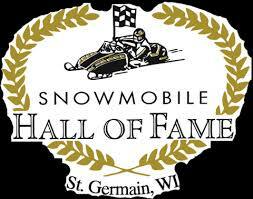 The Snowmobile Hall of Fame, located in St. Germain, Wisconsin, has announced that the Ride With The Champs, which is part of the day-long event leading to the ceremony for the annual Hall of Fame inductions, is sponsoring a new trail ride called the Vintage Yamaha 100. This ride is in addition to the Swamp Challenge and Vintage Challenge rides that take place Saturday of the Induction. The past several years the Ride With the Champs event has grown and we have had increased participation from the vintage John Deere fans along with a fair amount of Arctic Cats and a few Yamaha’s here and there each year, states Jon Bertolino leader of the Vintage Yamaha 100. The event has modern and vintage rides but the vintage rides have been growing year over year. With Yamaha having been the number one selling snowmobile brand for all of the 1980’s the Hall of Fame thought that the fans of Yamaha snowmobiles would enjoy participating in a guided ride that challenges the rider to complete 100 miles on their favorite Yamaha that is more 20 years old. The sponsored ride will be 100 miles. There will be gas stops, and a chase trailer in the event that some owner forgot to tighten a bolt down before taking to the ride. The ride is part of the Ride With the Champs event at the Snowmobile Hall of Fame, which means when you register you get breakfast, lunch and dinner in addition to admittance to the evening autograph session and induction ceremony at the White Tail Lodge in St. Germain, WI. Interested riders are invited to come on Friday, February 12 to “test” and “tune” your sled on a poker run or other local rides that day. Turn-out for the Friday ride and evening fish fry has been very popular. Plymouth, Minnesota (November 25, 2015) – Tucker Hibbert wins – a lot. In fact, with over 100 victories to his credit he’s the winningest racer in Pro snocross history. During the 2015-2016 snocross racing season, fans can win too by signing up for the Tucker Hibbert Wins – You Win Giveaway. Every time Hibbert wins a final during the 2015-2016 ISOC season and Winter X Games, five people will win a C-TEC2 prize pack which includes a pouch of Arctic Cat C-TEC2 Synthetic Oil and a hat, both autographed by Tucker Hibbert. All you need to do is sign up once and you’re good for the entire season – that means you get 90 possible chances to win with Tucker Hibbert! Arctic Cat C-TEC2 Synthetic Oil was specifically-developed over a three-year period to meet the unique lubrication needs of the groundbreaking Arctic Cat 600 C-TEC2 engine. C-TEC2 Synthetic Oil has superior cold flow properties and offers the highest levels of engine protection for all Arctic Cat 2-stroke snowmobiles. It is the only oil used by the winningest racer in snocross, Tucker Hibbert.